It’s been a tough week in America for the truth. While the hate Trump media counts all the President’s “lies,” the Democrat who replied to Mr. Trump’s State of the Union speech put three whoppers out there with no scrutiny whatsoever. Stacey Abrams, who almost won the governorship of Georgia, told the world that the U.S. economy is essentially bad. By every calculated measure, that is a false statement. Then Ms. Abrams stated that the federal tax cut has not benefited working Americans. Not true. An exhaustive study by the Cato Institute shows the average family of four pays about $3,000 in taxes less than it did before the cut. Finally, Ms. Abrams contends that “voter suppression” is a huge national problem when there is not a shred of evidence to back that up. 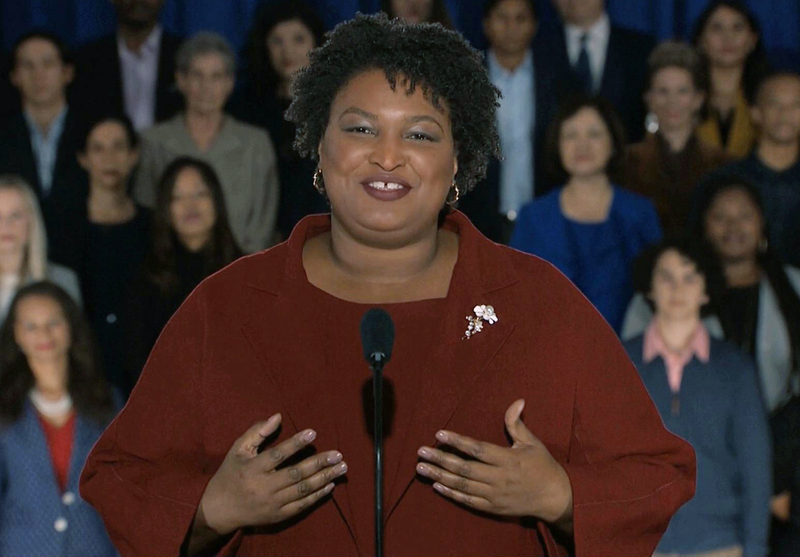 In fact, Georgia had a near record turnout for the vote on Ms. Abrams’ candidacy. Even though Stacey Abrams misled all who watched her speech, CNN’s Anderson Cooper said on the air that he liked her talk better than President Trump’s address. The only thing that I can think of is that Mr. Cooper is a big fan of Jon Lovitz, the compulsive liar on Saturday Night Live. Yeah, that’s the ticket. Then there’s the border wall thing. The left is saying it’s a fabricated crisis, that it’s fear-mongering by President Trump and his allies. Hard to believe when tens of thousands of migrants are being bused to the U.S. border with the intent of illegally crossing into the USA. And then there’s the tons of narcotics that are smuggled across the border by murderous cartels. But no worries, mate. It’s fear-mongering bunky. Finally, late term abortion. It was actually applauded in New York State by people who apparently believe that the vague category of a “woman’s health” is a valid reason to terminate a baby who could live outside the womb. In Virginia, the governor there agrees with Adolf Hitler that even a birthed baby can be executed if the mother doesn’t want it. The T-4 program in Nazi Germany killed an estimated 300,000 babies. What’s the difference from the brutal idiocy coming out of Richmond? There is truth in the world but it is now being obscured by fanatics who want to advance their political agenda at any cost - even if that means terminating infants alive in front of them. What say you, Kamala Harris? It is my job to tell you the truth so here it is - too many Americans are more than happy to accept lies and turn the other way while bad things happen. That kind of national attitude will lead to disaster. It’s just a matter of time. Last edited by Garden House Queen; 02-12-2019 at 05:07 AM. It's a lot easier to just wear a bra than to hold your ma'am Ray glands up in public when speaking. Abrams said she was Christian. Just how does she square God's laws (thou salt not kill) with the Democratic agenda? And this is why some filers who usually get a refund may be getting a smaller refund. The MSM has been pushing the "smaller refund" issue without mentioning this fact. Net tax consumers will be influenced by this campaign, while net tax payers will (or should) recognize the falsehood. Last edited by MrogersNhood; 02-16-2019 at 05:17 AM.